iPad mini with Retina display comes with 7.9 inches screen, new A7 chip, the M7 coprocessor, advanced wireless, and - most importantly - the Retina display with 2048-by-1536-resolution (four times the resolution of the previous-generation iPad mini) and over 3.1 million pixels (a million more than an HDTV). So videos look incredibly detailed, vibrant, and razor sharp. No doubt, playing HD videos on iPad mini with Retina display would be an amazing experience. You may happen to have videos in MKV (HD video, 720p/1080p), and want to play them on iPad mini with Retina display. But when you transfer a MKV video to iPad mini Retina, an error message jump out, said that unrecognized media file. iPad mini Retina only supports M4V, MP4, and MOV file formats with H.264 video or MPEG4 video. Therefore, to make MKV videos playable on iPad mini Retina, you should convert MKV to iPad mini Retina as H.264 video or MPEG4 video. There is an amount of video processing software you can find on the internet. Much of the software claims to have the same strong abilities, so you may find it hard to distinguish the one that would suit you best. For transcoding MKV to iPad mini with Retina display, MacX Video Converter Pro would be your best choice. MacX video converter Pro can encode HD 720P/1080P MKV to iPad mini with Retina display(iPad Pro/mini 4/Air 2 etc) with the world's fastest speed and untouched quality! It can easily convert MKV to iPad mini Retina in MPEG4 or H.264 video, be it in HD 720P/1080P with flawless video quality. More importantly, it delivers the world's fastest speed in video processing by using the Intel's QSV hardware acceleration tech. Besides iPad mini Retina, it integrates wide range of popular devices like iPad Pro, iPad mini 4/Air 2, iPhone X/8/7/6S/6S Plus/6/6 Plus/5S, Samsung Galaxy S8 and Android and more. Step 1: Import Video File. Free download the Mac (High Serria supported) or PC version (Windows 10 incl.) of this MKV to iPad mini Retina converter on your computer, install and run it. Click "Add File" button to import the MKV file you want to add. Or drag and drop the MKV video you want to convert. 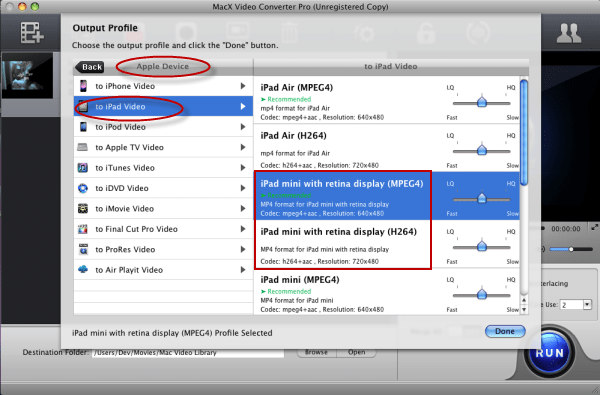 This iPad mini Retina video converter for Mac is preset with optimized profiles for your iPad mini with Retina display. To do it, just go and hit "Apple Device" -> "to iPad Video" and choose the specific generation of iPad at your fingertips. Then click "Done" button to finish the output format selection. Tips: MacX Video Converter Pro not only helps to convert among SD and HD videos on Mac OS, but also enables to download 300+ online sites videos like Vimeo, Vevo, Dailymotion, YouTube to iPad mini with Retina Display, other iPhone, iPad and Android in a few clicks. Click "RUN" button to start MKV to iPad mini Retina conversion on Mac OS. After a short period of transition, you can sync the converted video to your iPad mini with Retina display via iTunes and play unfriendly video files on iPad mini with retina display anywhere anytime. Tips: it's also at your disposal to edit the video file before you convert MKV to iPad mini Retina. Just click the "Edit" button on the main interface of this iPad mini Retina video converter and then you can trim, crop and merge videos, add watermark and even external subtitle as you like. For more information, you can visit the user guide of this iPad mini (retina) video converter. This tutorial introduces you the best YouTube to iPad mini with Retina display downloader that helps you to download YouTube video and convert to iPad mini Retina flawlessly, so that you can play YouTube videos on this new iPad mini with Retina display whenever you want. Do you want to encode video for playback on iPad tablet? This article shares 3 best video converter for iPad and tells you how to transcode FLV AVI MKV M2TS to iPad (iPad 4/3/2, iPad Mini with Retina, iPad Air/2) viewable format easily. What video formats can be playable on iPad Air and iPad mini with Retina display? You may get know all the supported video formats for iPad Air and iPad mini with Retina display here and use free iPad DVD ripper or video converter on Mac to transfer the DVDs or videos to any iPad.